Claims opposition politicians little more than “organic scenery’ if the government determines how much governmencriticism reaches the people. Parliament likely to modify constitution to rule out settlement of foreigners in Hungary without parliament’s consent. Democratic opposition parties could have won all of Budapest’s 18 electoral districts had they coordinated their candidates, election data reveals. Parliamentary supermajority will enable governing party to fill key positions and modify the constitution without consulting the political opposition. This country’s money belongs to Hungary and the Hungarian people, not Viktor Orbán’s family and their narrow circle of friends, says Jobbik chairman. 15,000 seat area can be expanded to 55,000. In Hungary it is not uncommon for the boyfriends or spouses of government officials to feed at the public trough. Country for All Movement: Orbán must go! 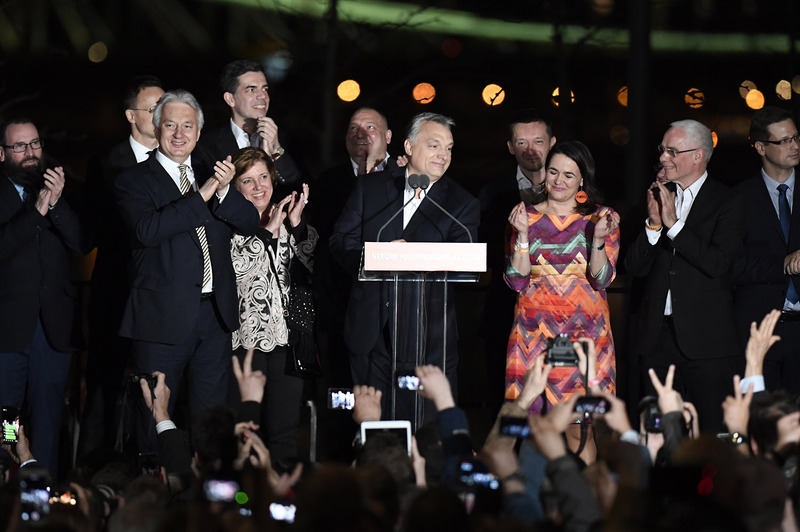 Movement warns that Viktor Orbán would use supermajority to wind up judicial independence, steal local elections, and further enrich Fidesz oligarchs. Projecting voter participation of 64%, of which 44% will cast their second vote for the Fidesz-KDNP national list of candidates.